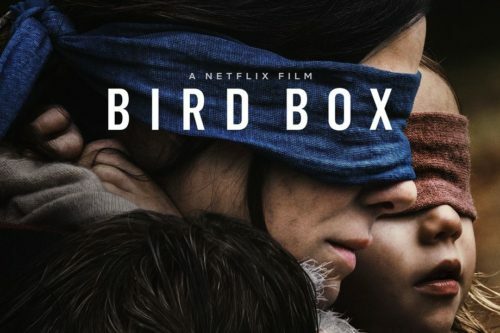 In December, Netflix released an apocalyptic thriller called Bird Box, which has audio description for the visually impaired and captions for the Deaf. The film features humans trying to survive an invasion of creatures that, if seen, will make people want to kill themselves instantly. To survive as they navigate this new landscape, characters have to blindfold themselves. After the movie aired, the #birdboxchallenge meme went viral. To take the challenge, people try to do random ordinary things while blindfolded such as driving cars, cutting food, putting on clothes, and walking outside without a navigational aid or proper training. Netflix released a statement on Twitter pleading with people not to hurt themselves while doing the challenge. I never thought I’d meet a participant. I was wrong. It’s so sudden, I leap out of my skin. I’m at the library, navigating to my favorite table with my Victor Reader Stream in hand and laptop in my backpack. As soon as I start to pull the chair out, it moves on its own and without thinking I just lunge for the chair and knock someone over. Before I can help them up, they spring to their feet. I turn to the person and smile. “I’m sorry about that,” I say, as they gasp and squeal and gasp again. I’m thinking that maybe they’ve broken something, but I’m proven wrong when a very warm hand daintily pats my hand, which I’m still resting on the back of the chair, so I don’t get lost or turned around. I’ve never been a good blind person. I can’t even boil water, while my fellow blind superheroes make heaping dinners for me. I flash back to a few seconds ago to double check that I haven’t been gaslighting myself, but my short-term memory replays the incident. They fell over, not me. I think I’m OK, surely. I tell the person this and they squeal and squeeze my hand tighter before suddenly jumping back like I’ve just dropped all my clothing to the ground. Finally, glad that I can take a seat, I ask whoever it is why they decided to just yank the chair out from under me like that. “Thanks, but usually, when I pull a chair out, it stays put. Unless, well, someone moves it.” I can’t help it, I flash them a Colgate smile, laughing at my little private joke. I hope I’m talking to another gay guy, but I’m not sure. Their deep, stereotypically masculine voice makes me want to touch them to see if they have rippling muscles. I sling my backpack to the floor and stretch out a hand. A very hot huge hand grips mine firmly. “I’m Robert. What’s your name?” I ask. “I’m Ryan. And I’m sorry about that. I was just so shocked,” he blurts. “What’s that?” Ryan asks. I don’t answer. Instead, I sit back and wait for him to continue. I’ve seen a ton of foolish people do the #birdboxchallenge online. My rule when dealing with people on the internet, especially when talking to sighted people about screen readers and similar, is to hold three concepts in my head. One: sighted people are extremely lazy. Two: sighted people are incredibly stupid about blindness. And three: they don’t want to spend 20 seconds Googling how blind people use a computer, but will spend 200 years researching if the earth is flat. I never assumed that I’d meet a real-life stupid person though. I usually keep my real-world life in a bubble alongside others who have common sense, but I guess there’s a first time for everything. “Oh good.” I snap. “So how hard was it learning NVDA?” they don’t say a word. I try again. “What cane techniques did you learn? Two-point touch? Shoreline?” when they tell me they don’t even know what NVDA is, I shake my head and decide to lay it out there. “I’ll be glad to teach you!” I say, giving them a dashing smile. Using my superpower of epic proportions, an Apple device with VoiceOver turned on, I take down their number before I begin. An hour later, after the lesson about cane travel and screen readers is complete, I send them a PayPal invoice for $250. What’s the point of doing something dangerous if you don’t even learn from the experience? I thought that, eventually, this ridiculous #birdboxchallenge would die off and I wouldn’t have to roll my eyes every time I opened up Twitter. But the United States has elected Trump as president, so I can’t be too shocked at its stupidity level. What I am shocked about, though, is just how ignorant people still are after doing the challenge. My line of thinking is, if you’re going to do something stupid, at least, learn from it. Like I and millions of other blind people have to constantly learn, just to survive. When people do the #birdboxchallenge, they learn that this certain task is hard and they’re not going beyond that. After taking off the blindfold, I am 100 per cent certain nobody looks up how a smart cane or screen reader works or what a braille display is. There are already people who have ended up in car wrecks because they were dumb enough to try this challenge. And it will do nothing to educate the public about how blind people live. A better #birdboxchallenge could be a great educational tool: you could try to use a screen reader blindfolded for the first time, or collaborate with your blind friend or partner to learn at least two cane techniques. I don’t see anybody doing that, though. Instead, I see ignorant sighted people getting a thrill out of being in danger. I know Netflix didn’t create the #birdboxchallenge. Only ignorant people could do such a foolish thing. But I wish that society could learn something from it. I’d love it if a sighted person came up to me and said, ‘I tried using VoiceOver on my iPhone for a month and now have a better understanding of how you do things’. I’d love it if a sighted person used their #birdboxchallenge to watch an audio described movie. I’d love it if a sighted person browsed the web with NVDA for a week for their #birdboxchallenge, if only to grasp how severe my challenges are. Until that happens, I have a dozen PayPal invoices ready and waiting to be sent out. We’ll see, though, maybe the #birdboxchallenge can change. Maybe.